Balustrade, piers and pier caps made in GFRC from Stromberg. 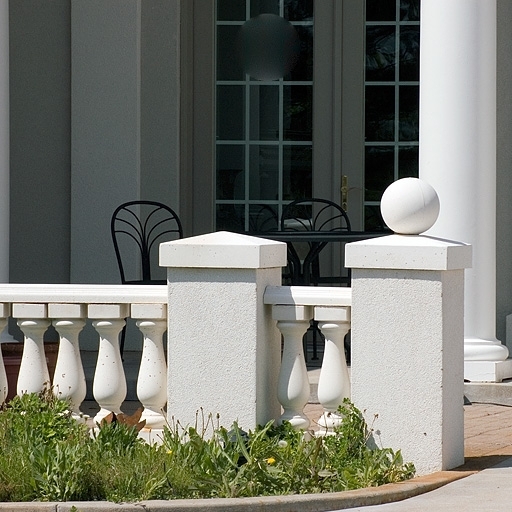 Cast stone has been the go-to construction material for numerous projects because of its availability and durability. However, in recent years, new alternative materials have been developed that offer some significant advantages over cast stone. Here we provide a comparison between cast stone and GFRC to illustrate the advantages of GFRC for today’s restoration and construction projects. Cast stone has been used for centuries, starting with the Egyptian pyramids. It was made by hand packing molds that have been created and then using pressure to cast it into a shape similar to the forces in nature that created limestone from lime, slurry, and sand. Sand is compacted along with crushed limestone, and a colored pigment of your choice. Water is added to hold the materials together and give it the look of limestone. The final product resembles limestone or sandstone. Cast stone is often used on projects where limestone or sandstone is preferred. However, the cast stone is much cheaper and offers a close enough alternative to be accepted. Another more recent option added in the last few decades is GFRC. It is a glass fiber reinforced concrete that is also manufactured to give the appearance of natural stone. This material is also made in molds and can be made to look like just about any type of natural stone, including limestone and sandstone. However, this material is thinner and weighs a fraction of solid stone yet it is extremely strong and durable. As noted above, GFRC is lightweight and stronger than cast stone, providing some significant advantages for the construction company that is using it. Its lighter weight means that more of it can be transported at one time, saving on costs and environmental impact. This also means that more of it can be lifted and applied to a building and requires fewer workers to get the work done, saving time and money. Finally, GFRC lowers the overall building load, giving the building a longer life and reducing the overall project cost by a considerable amount, especially when compared to the significant weight of cast stone. The durability of GFRC is also a huge advantage. Studies show that GFRC can reduce seismic load and withstand powerful weather forces, including hurricane winds as well as water. In contrast, cast stone does not hold up as well. Other environmental advantages associated with GFRC include its thinner skin, which leaves more room to add insulation to a building. More insulation leads to greater energy savings. Cast stone, on the other hand, is much thicker and leaves no room for more insulation. The result is a lower level of energy savings if cast stone is used. Paving the way for innovative architectural solutions that use GFRC versus relying on cast stone, Stromberg Architectural has successfully helped contractors and building owners complete thousands of projects. If you are looking for a great alternative to cast stone, get more information and a free estimate for your next construction project by filling out our online contact form or calling 903-454-0904. Precast Concrete: Why Use GFRC?